This famous and interesting surname recorded as Tock, Took, Toke, Tuck and Tuke, is usually English, can be Scottish, but in either case is of pre 7th century Norse-Viking origins. It derives from the Scandinavian personal name variously recorded as Toki, Toka or Toke, short or nickname forms of Thorketill. This popular personal and later surname, was a compound of the divine name Thor, the Viking mythological god of thunder and the originator of Thors day or Thursday, plus "ketill", meaning a cauldron. Amongst the earliest recordings are those Askyl Tokes who signed a charter in the time of King Edward of England, and known to history as "The Confessor" in the year 1050, whilst Tukke, given as being a faber or ironworker, appears in the register of the abbey of St. Benet at Holme in Norfolk, and dated 1101. In Scotland a man called Tocca is recorded as holding the land of Perdeyc (Patrick) in a charter by King David 1st of Scotland to the church of Glasgow in 1136. Perhaps the most famous holder of the name was almost certainly mythical, being that of Friar Tuck in the ancient fables of Robin Hood in the 12th century. Other recordings taken from proven surviving rolls and charters include Peter Tuck, in the Close Rolls of the city of London in 1278, and Symone Tok, a charter witness in Aberdeen, Scotland, in 1281. 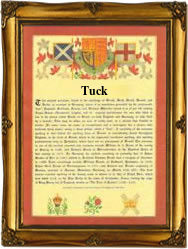 The first recorded spelling of the family name is shown to be that of Robert Tucke. This was dated 1202 in the fines tax rolls of Norfolk, during the reign of king John of England, 1199 - 1216. Throughout the centuries, surnames in every country have continued to "develop" often leading to astonishing variants of the original spelling.